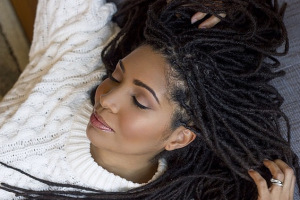 Jasmin is definitely dope and beyond majestic! I started following her journey on Instagram over a year ago, and from her page you would never be able to tell that at one point she hated her hair. 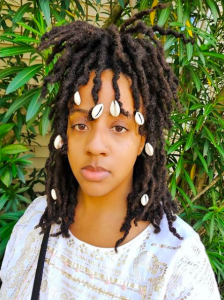 Reading the story behind her journey is truly inspiring— especially if you have ever felt like you were not going to be accepted because of your locs. My name is Jasmin, and I’m from New Orleans, La. I just turned 30 in November, I love 75 degree sunny weather, I enjoy spending time with people I love, and I also enjoy spending time alone and giving myself self care. I’m also involved in mental health work. I definitely didn’t plan on ever having locs. My hair has been chemically processed for more than half of my life. One summer back when I was twenty-six I decided to get faux locs because I liked how they looked. I got so many compliments, and I really loved them myself. 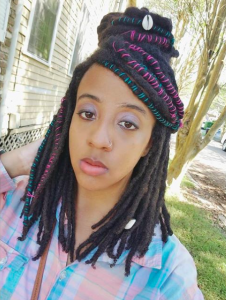 People who had real locs even complimented me, and said they bet I would look great with real locs, to which I thought in my head “Hell No” I’d never worn my hair in it’s natural state (except when I was a baby). I didn’t even like my natural hair at this point. Sadly I thought it was too nappy to be accepted by society. I did try to transition into having natural hair once before, but I always wore my hair straightened, or under a weave during the process. I couldn’t bring myself to wear it how it naturally grows out of my scalp. I LOVED faux locs though. I loved them so much I ended up wearing faux locs for two years. Every time I would get them re-done I didn’t go back to getting a relaxer. My hair was getting really healthy, and very VERY thick. 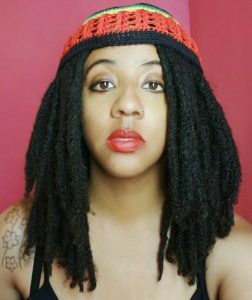 Finally, I decided if I really loved faux locs this much, I should just go on and get the real deal. If I didn’t like it I could always take them out. 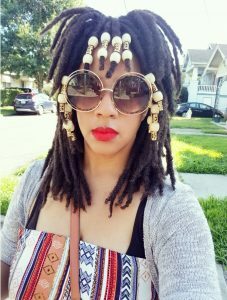 I finally started my real locs, but I was still scared to wear them out, so I continued to wear faux locs on top of them for about six months. Finally I said to myself “I just want to be free”— I don’t want to hide anymore. I want to love my natural self completely, and not give a damn about what society thinks. “Don’t Touch My Hair” by Solange had just come out around that time. The way I finally transitioned into wearing my real locs out was by listening to that song on repeat, and slowly taking the faux locs out to reveal the real locs underneath. That next day I went to the salon and asked for my first retwist. 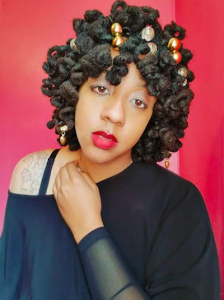 After my hair was retwisted, I went into the salon bathroom, added some loc jewels to my hair, and walked out that salon with my head held high. 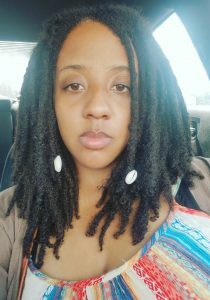 I ended up loving my locs from that day on, and have never went back since. Two years. I have 87 locs. I started out with 88 two-strand twists. I decided to combine only that one time, although I really didn’t need to. This was in the very beginning and I didn’t realize how much my locs would expand to grow thicker over time. In the beginning, I maintained every eight weeks; but in the second year of my journey I went 10 months without a retwist, and I loved it. For the most part, I have hair that grows with my locs instead of away from it, so not retwisting for so long wasn’t bad for me. Moving forward I’m not sure how I want my retwist schedule to be just yet. I just know I won’t be retwisting often. 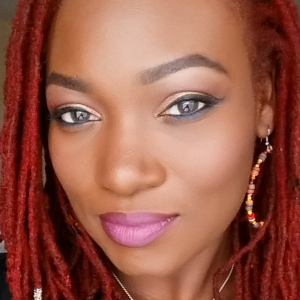 What are a few of your favorite products to use on your locs? Grapeseed oil (or vitamin e oil) and rosewater is usually my go to. For washing I love Giovanni triple threat tea tree shampoo (found at whole foods). I’m simple and definitely not a product junky. That my natural hair is beautiful and I was insane to let society let me think any differently! Wax is the devil to my locs (it does not like it at all), and less is more when it comes to my locs (I don’t like a bunch of products. I literally only use oil and water to retwist). And that I can actually maintain my locs myself (which I do, and it has saved me a lot of money). 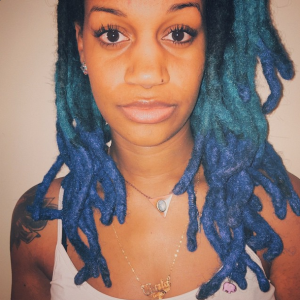 Embrace your loc journey to the fullest, research good and bad loc products, and never retwist too often.